Jesse Nolan Kelly, born July 20, 1981, is a conservative Iraq War veteran who ran as a Republican for the U.S. House of Representatives in the 8th congressional district of Arizona in the 2010 election. He very narrowly lost the election to incumbent Democrat Representative Gabrielle Giffords. Kelly, at age 28, had never held office or run for office before. He raised $114,000 in July-Aug.-Sept 2009. On April 17, 2012, Kelly won the Republican primary for the Arizona 8th Congressional special election in June 2012 with 35.1% of the vote in a four-person race. However, Kelly went on to lose the special election on June 12, 2012 to Democrat Ron Barber, winning 45.3% of the vote to Barber's 52.2%. Kelly briefly attended Montana State University and left prior to completion, instead deciding to serve his country and join the United States Marine Corps. 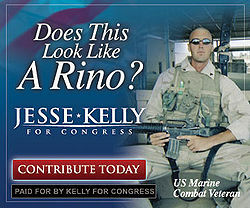 Kelly served four years in the Marine Corps (from 2000 to 2004) obtaining the rank of Corporal; he saw combat while deployed during Operation Iraqi Freedom as a squad leader in the Mortar Section of Weapons Platoon, Alpha Company, 1st Battalion 7th Marines. While in the Individual Ready Reserve (IRR), Kelly obtained the rank of Sergeant. Kelly works in the family construction business in Tucson. Managing multimillion-dollar infrastructure projects for state and local governments throughout the Southwestern United States, his duties include: estimating, scheduling, budget analysis, and human resource management. He is married to Aubrey Kelly. The couple live in Marana, Arizona with their two children. The family attends Alive Christian Fellowship Church of Tucson. Kelly is pro-life and a pro-Second Amendment member of the NRA, and holds many additional traditional conservative values. Former Congressman Barry Goldwater, Jr.
Kelly is active in local and national media and the Internet. He has appeared on the Fox News Channel and heard on national radio shows such as the Mark Levin Show, America's Morning News, and the Wilkow Majority. Some appearances can be seen on his YouTube page. Additionally, Kelly has run national advertising on the Drudge Report. This page was last modified on 26 September 2018, at 12:47. This page has been accessed 53,946 times.